← The Rave Awards! Have you voted? 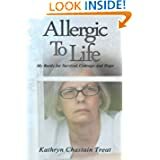 This entry was posted in Allergic to Life: My Battle for Survival, Allergies and Sensitivities, Chronic Illness and Treatment, Environmental Illness, Mold, Mold Exposure, Multiple Chemical Sensitivity, Toxic Free Living, Uncategorized and tagged $300 Holiday Cash Giveaway, allergic to life, followers, I Am A Reader, thank you. Bookmark the permalink. Kathryn what a thoughtful blog. I will have to do the same on mine. I appreciate you as a survivor. You are a fighter! Good luck to you. Thank you Shirley. Your comment means a lot to me. Tracy, anyone can enter this giveaway for a chance to win $300 in Holiday Cash.